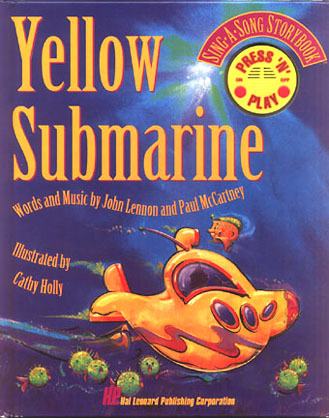 This 24-page authorized Storybook was printed in 1993 by Hal Leonard Publishing Corp. The last two pages contained the complete sheet music for the song Yellow Submarine. Pushing the Press 'N' Play button on the front played an instrumental version of the song. This was volume 4 in a series of different Sing-A-Song titles. Many collectors have not been aware that this item was produced. The printing quantity is unknown, and it so far has proven somewhat difficult to find. Click on image for enlargement.